Imran Mir belongs amongst the tribes of Piet Mondrian and Wassily Kandinsky as he is an exponent of geometrical abstraction. “People think my art is geometry. Yes, I do geometry,” acknowledges Mir. “The Art Society of Washington did a seminar on me. They asked me why I draw these designs. I said I was bad in Math when I was in school and I am hoping to solve my Math problems now,” is his half-jesting response to his geometrical reaction. Of his exhibition, opened at Paradise Road Galleries, six exhibits are couples. “They are paired. They are like dialogues, talking to each other,” Mir hinted at their depths. “If you look at the whole properly, you will understand. I don’t have to explain.” Of a pair of circles, one is perfectly drawn while the other is a free hand drawing. 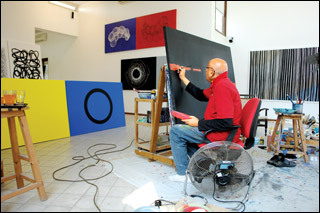 There is a considerable gap between his exhibitions as he says, “I exhibit only when I think my work is new. I don’t want to repeat my work. If I don’t do anything new, I don’t exhibit.” He calls his exhibitions “papers” as holding one is like working on a paper or a thesis. It involves selecting a subject, researching it, retrieving solutions and presenting them in a logical manner in the form of a series of paintings. Looking at Mir’s paintings, one also recalls to mind that Islamic art, being prohibited to depict religious figures, became a geometrical pattern-based art, even centuries before the abstract art movement in Europe. Geometric patterns visually connected spirituality with science and art. Mir has picked on Sri Lanka as the latest venue for his exhibits “as I have friends here.” Once it concludes, he contemplates going back home to Karachi. This “home” has been designed by Sri Lankan architect Anjalendran. “He introduced Sri Lanka to me,” says an inspired Mir. The first ever exhibition in Sri Lanka of Pakistani artist Imran Mir Azam Ali opened to the public at Paradise Road Galleries, Colombo 3, on January 24 and will continue until February 21. Imran Mir, a top honours Master’s graduate in Communication Design from the prestigious Ontario College of Art, Toronto, Canada, in 1976, was the only foreigner to win the Governor General of Canada’s Trophy for the Best Student in the college’s 100 year history. Prior to that, he had graduated from the Central Institute of Arts and Crafts in Karachi. He is the Chairman of Circuit Advertising, affiliated with DraftFCB Worldwide, counting Sri Lanka among its country branches. He is a founder of the Indus Valley School of Art and Architecture in Pakistan. He is also a trustee of the Foundation for Museum of Modern Art (FOMMA) and plays a key role in the publication of art books by FOMMA in Pakistan. Married with two sons who plan to return from America and join his ad agency, Mir lives in Karachi, in a much publicised house, considered a watershed in modern Pakistani architecture. He is also a keen gardener who helps friends to do up their gardens.